Shearing season is almost there. I am preparing my equipment and some clients have already scheduled their shearing date. 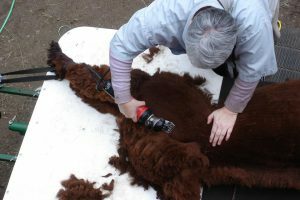 The first alpacas will be shorn during the last week of April. The last one will be scheduled for the end of June. July and August temperatures are too high for me and especially for the animals. What will you do with your fiber? The bigger farms here on the island make products out of their fiber. The most popular colour is white because the fleece can be stained in any imaginable colours. I often see socks and scarves. I do not see lots of mittens and gloves because the winters here are mild compared to the rest of the Country. Most of the best fiber is used to make yarn which is then sold or used to make garment. The lesser quality fiber is often discarded. I use this fiber on raised gardens. It keeps the humidity in the ground and our plants looks great. 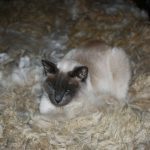 I read an article from a farm in Missouri and they use the fiber to make rugs, felting and filling for dog toys. The author says that her dogs love those toys. Cats love this fiber also. Do not use fibre from an animal infested by lice. If you want ideas, tell me. I will find answers from my breeder network and get back to you. If you do nothing with your fiber, give it to a breeder that will use it. Have fun with this marvelous fleece produced by your own animals.